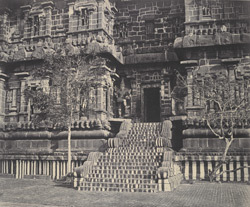 This photograph of the side entrance of the Brihadisvara temple, Tanjore, Tamilnadu, is part of a collection entitled 'Photographic Views in Tanjore and Trivady ' (Madras, 1858) and was taken by Linnaeus Tripe in 1858. The Brihadishvara Temple built by the Chola king Rajaraja around 1010, is a monumental temple standing in the middle of a large courtyard surrounded by smaller shrines. To the east, a monolithic Nandi is sheltered in a 16th century pavilion. On the north-west of the main shrine, there is a temple dedicated to Subrahmanya dating to the 17th century. The temple is entered through the east by two gateways.